In Puck's Gulch, sixteen-year-olds undergo a Quest. Magical tokens are given to them when they perform good deeds, and omens appear near them when they do bad ones. During the five-day Quest, the tokens they earn can be used to defeat the omens. At the end of the Quest, they will discover where their futures lay, and what trade they will be apprenticed to. Generally, each teen must go into the forest for their Quest and battle their omens on their own. 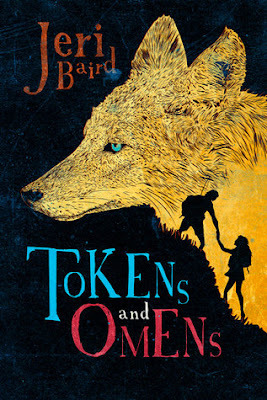 Sometimes a teen might get a gift ahead of the Quest, and each one has a patron animal that they can call upon to aid them if the Quest is too dangerous. Zander, the son of the furrier, receives a gift, as does Alexa, the daughter of the baker. There are thirteen teens to undergo the Quest this year, as well as secrets within the village. Fate cannot be cheated and will punish those who try. This was an interesting take on the trope of teens undergoing physical and mental trials. The characters were generally likable, even the ones that clearly were painted as the antagonist of the story. There is a sharp difference in the classes of workers within the village, and the teens' responses to this were very believable. In a world of fortune tellers, magic potions, a living embodiment of Fate and the ghost of the village's founder whispering to Zander, it very easily could have strayed too far into the fantastic that it would be hard to connect with. Even with these elements presented as part of the world the characters live in, the focus of the story was on the teenagers and the relationships they had with each other and with the adults in the village. Feelings changed over time, they made mistakes, they could be petty or jealous. At the same time, they were also capable of great acts of kindness, and as a reader, I was able to understand their conflicts and how they grew. I felt the same outrage that they did for rules being broken or for the inequalities in the village to continually come down on Zander; he's easily the most sympathetic character from the outset. Alexa had to grow on me, which she did as she learned from her mistakes. The ending of the story was very hopeful and still fit in with the rest of the story, and kept with the theme of choices defining the individual. While it's clearly the first book in a series, this can stand alone as a single book. It's a very engaging and enjoyable read.